When designing user forms in DriveWorks Administrator it is important to use fonts that are available on all machines your projects are to be specified on. Many applications install fonts by default, so what is available on your machine may not be available on others. This is particularly necessary when using DriveWorks Live, where many device types and operating systems are used. The table below lists the most commonly used fonts available on Windows (Windows 7 or newer) operating systems. Using any of these fonts will ensure your forms display correctly when specifying on any machine with a DriveWorks client module (Administrator, User or Autopilot). When using any other font, please make sure it is installed on each machine using the project. However, when using DriveWorks Live your projects can be specified on any type of device or operating system. These may not have the same fonts installed. When a browser loads a DriveWorks form it will try and find the font used on the clients machine or device. If the font is not found it will fallback to the default font declared in the .css for the page being loaded. The .css will list the fallback font in order of preference, usually ending with a font-family name that all browsers are aware of. The only way to ensure a non-standard font is displayed correctly is to embed the font into the .css (see Non-Standard Fonts below). The table below lists fonts that are standard to Windows and Mac systems along with the fallback font-family name used for other devices. Non-standard fonts need to be embedded in the .css used to display fonts. If you are using DriveWorks Live, and have already customized the Skin (in line with the instructions given in the section Skin Customization in the topic Customize the Web Theme - Advanced), follow the instructions below from step 3. Embedding fonts is only supported for the Web Theme. Navigate to the DriveWorks Live Skins folder. Navigate to the fonts folder. Navigate to the .TTF file for your custom font. Copy the .TTF font file. Open the skin.fonts.css file from the Skins folder you copied in step 2 above. Use Notepad to edit the file. font-weight and font-style values should be set to your preference. Add the Font Name value to all font-family attributes in the skin.font.css file. Save your changes and test out your new embedded font. Test on a computer or device that doesn’t have the embedded font installed. If your embedded font doesn’t display, use the developer tools in your browser to inspect what font name the browser is expecting. 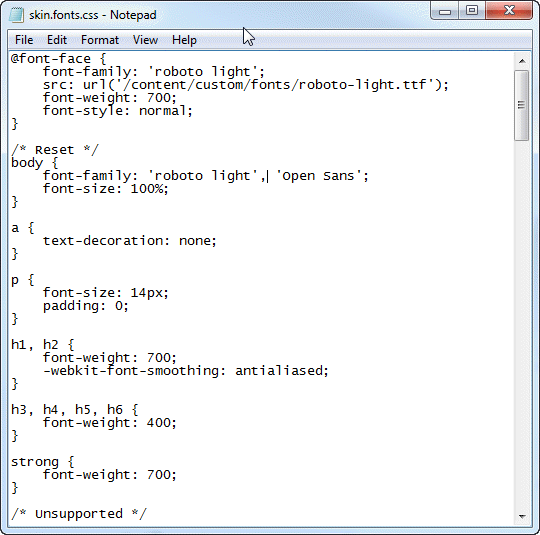 You can then amend your font.skins.css file. When running DriveWorks Live through IIS, recycle the Application Pool to ensure that any cached files are removed and the new embedded font is displayed.